There are many car park guidance systems in the market but none that have the accuracy of the IntelliPark system. IntelliPark efficiently directs traffic to the most readily accessible locations, maximizing utility of available parking lots by revealing those difficult to find spaces, and decreasing uncertainties that lead to disputes. Faster bay turnaround means increased revenue. IntelliPark comprises two philosophical approaches to car park management, IntelliPark Count and IntelliPark Monitor. IntelliPark Count works by counting vehicle movements at various points throughout the car park by using wired laser sensors. IntelliPark Count does not observe the occupancy of individual bays but rather provides constantly updated snapshots of the total number of vehicles that have entered and exited the whole car park, or certain zones of it; this data in turn drives the directional LED signs and the organisation's parking availability website. IntelliPark Count calculates the number of vehicles present in a car park by subtracting the number of vehicles that have left the car park from the number of cars that have come into it. IntelliPark Monitor uses either wired laser (for undercover car parks) or combined wireless infrared and magnetic sensors (for open car park areas) just to monitor individual bay occupancy, but can be combined with IntelliPark Count to also track vehicle movements through a car park. In addition to allowing bay occupancy times to be recorded (for infringement enforcement), IntelliPark Monitor enables special sub-zones (i.e. disabled, loading, reserved bays) to be monitored and excluded from the rest of the total number of available parking bays. IntelliPark provides a low maintenance, high performance solution for all your parking information needs. From top to bottom, your organisation will have immediate access to the right information for proper analysis and action. You’ll be able to control your entire guidance system from the comfort of your own office, on your own desktop computer or a wireless handheld device (phone, ipad or tablet). Holman has installed and commissioned IntelliPark in many car parks around Australia. IntelliPark Count uses laser measuring devices (mounted in grey conduit in above photo) to both categorise and count vehicles reliably in a one or two lane entry and/or exit. IntelliPark Count provides the most fail-safe means for accurately counting vehicles entering and exiting a car park: it can have vehicles going in and out at the same time and it will accurately count both vehicles correctly as in and/or out. It will count accurately even if a vehicle goes through the count point on an angle. IntelliPark Count will count vehicles even if they are tailgating (all it needs is a 20 mm gap), unlike traditional loop detectors and cameras (which invariably produce counting errors due to seeing tailgating cars as one car and not two). IntelliPark Count can also determine a vehicle's direction of travel. The system detects all shaped vehicles - no matter the colour or texture - and can distinguish motorcycles and pedestrians, ensuring no false counts. IntelliPark Monitor also uses lasers to monitor the occupancy of individual bays (lasers are mounted in grey conduit one foot to the left of pipe in above image). Unlike ultrasonic technologies, that are susceptible to detection errors caused by wind, laser provides foolproof accuracy. 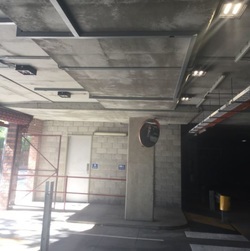 The wired laser sensors (which have an operating life of more than 11 years) face directly down onto the roof of a parked vehicle typically from a three metre ceiling; they are invisible and completely eye safe should someone look directly at the light. For outside parking spaces, IntelliPark Monitor uses wireless, battery operated, combined infrared and magnetic sensors (that have a 5-year operating life). Allows cars to be diverted from a carpark, level or zone before they arrive by ‘predicting’ when those areas will fill.